Members of the public and council staff hard at work clearing away weeds behind the Pavilion. Public volunteers met up with members of the Mount Stuart gardening team, council community services and the Pavilion charity to tidy up the outside of the building last week. The various groups gathered in the pouring rain on the morning of Wednesday, July 26, to clear weeds, prune hedges and generally clean up exterior of the Pavilion. The Mount Stuart Trust and the district council both lent equipment to the efforts. 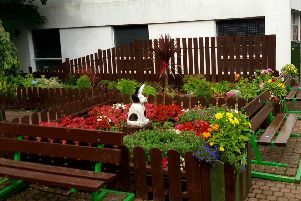 Volunteers worked alongside staff using gardening tools as well as more heavy-duty equipment in the car park in front of the building as well as the passages at either side and the lawn at the rear. The building itself is in the midst of an extensive refurbishment project due to finish in 2019, with the next stage of internal work to begin in November. Julia Twomlow is the executive director of the Rothesay Pavilion charity, and joined in the cleanup. She told the Buteman: “We got absolutely soaked but it was still fun. “The Pavilion will look like a building site for a lot longer yet but at least it looks a bit tidier for the summer.